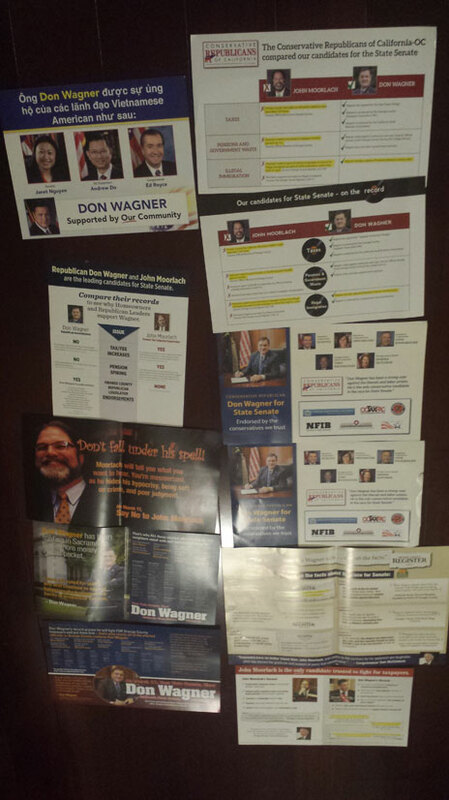 All the mail I got for the SD-37 special election. I really hope that I’m wrong about the election going to a run-off on May 19. I hope whoever comes in first tonight, whether it is Don Wagner or John Moorlach, gets more than 50% of the vote. A run-off would be bad for both candidates, their campaigns, and the voters. The candidates and their campaign staffs would have their lives continue to be on hold for another two months, and the voters would be subject to another endless barrage of campaign mail and robocalls (not to mention the $1.974 million price tag to taxpayers for the run-off). I imagine my aberrant voter behavior contributed to my voter contact level: I’m a poll voter who requested an absentee ballot on the first day you could request one, but then held on to it and surrendered it at the polling place to vote at the poll. Additionally, I was even had a voicemail from Don Wagner personally phone banking. The reason this race went so negative so fast is fundamentally, there are no real differences between Wagner and Moorlach. They will compile virtually identical voting records in the Senate. When there are no real policy differences, all you can do is go negative. As Jon Fleischman of the Flash Report put it at the beginning of this election, “The conservatives have already won.” The only real difference is one of style and priorities, but they’d vote the same, and Martin Wisckol’s piece in the OC Register was spot on. Usually, when we say there’s no difference between the candidates, it’s a complaint. In this election, it’s a compliment. We’ll know the results in a few minutes, and hopefully somebody breaks 50%. People who know me know I am a BIG fan of Governor Scott Walker. I had the honor of meeting Gov. Walker last Monday night (3/9/15). For so many reasons I admire him and hope he is our next President of the United States. The biggest reason I like him is he and his fellow Republicans in Wisconsin actually won the Governor’s office and majorities in both state legislative bodies then actually did what they campaigned on instead of “playing it safe.” In my opinion the reforms they passed have made Wisconsin a much better place to live, work and start a business. Plus this Governor has taken on the special interests in his state (mostly the labor unions) three times and best them three times so he has proven he is up for a fight politically. Jon Fleischman of the Flashreport.org did an excellent interview with which is at Breitbart California Interview: Governor Scott Walker. In this interview Gov. Walker, in a few words, lays out why he and his fellow Republicans did what they did in Wisconsin right after they were elected rather than kicking the can down the road. He did what I had hoped President George W. Bush would have done when he was elected with Republican majorities in the House and Senate. While I know Washington, D.C. is not Wisconsin, I believe Gov. Walker, if he becomes President Walker, and has Republican majorities in Congress will demand and lead for change in the federal government towards limited government, more power to the states (and the people) and away from Washington and strengthen our position in the world. In brief, it is obvious to me Gov. Walker believes in American Exceptionalism. Kudos to Jon Fleischman for this interview and I highly commend it to you. Katy Grimes is one of my favorite bloggers / correspondent. Partly because Katy pursues an important article with passion and doggedly searches out facts. She follows the facts to wherever they lead and is not afraid to ask those under her microscope tough questions. Most of the time she writes about government officials or programs that waste our tax dollars or abuse their power. In California, Katy has a truly target rich environment! One of the most powerful bureaucrats in California today is Mary Nichols, California’s Air Resources Board Chairwoman. The CARB is charged with the implementation of California’s Cap and Trade (also known as Cap and Tax) program to allegedly reduce green house gas emissions under AB32. As Katy lays out in great detail, Ms. Nichols, a lifelong career bureaucrat, has embraced this role with gusto and we, the citizens of California, are and will be paying the price for that gusto in the years to come. Did you notice that gas prices just jumped .10 to .20 per gallon in the last few days? Maybe not because gas prices have been dropping like a rock lately. But the drop is due to market forces like Saudi Arabia keeping oil production high. That can change at any moment. But what was the latest jump in California – a new Cap and Trade tax on gasoline ordered by CARB. And this is only the beginning. Therefore it is vital that Californians know and understand the bureaucrats who run programs like this one and I highly recommend you spend a few minutes and read Katy Grimes’ articles (the link is to Part II just published Jan. 2nd – there is a link to Part I there). The link to Katy’s article is CARB’s Mary Nichols. I also highly recommend you get a free subscription to Jon Fleischman’s Flashreport at http://www.flashreport.org/. The California Republican Party’s Fall 2013 Convention begins in Anaheim at 8:30 AM today at the Hilton and continues through Sunday. The party will hold elections for two-year terms three of the eight Regional Vice Chair positions (the other five were elected at the Spring convention). The Vice Chair for the South region (Orange, San Diego, and Imperial Counties), Tony Krvaric of San Diego, was elected in 2011 and is now up for election, as is the Vice Chair for Los Angeles County, Adam Abrahms of Santa Monica, and the Vice Chair for the Inland Empire (Riverside, San Bernardino, Inyo, and Mono Counties), Adele Harrison of Temecula. The headline speaker of the convention will be Saturday’s dinner speaker, Texas Governor Rick Perry. The more significant headline out of the convention is that earlier this week, Chairman Jim Brulte announced that the CRP’s seven-figure debt had been wiped out. This is all the more impressive since Brulte, who was elected Chairman earlier this year, began his debt retirement drive just six months ago. The most controversial item on the convention agenda will be the three competing proposals on how to handle CRP endorsements in a post-Prop 14 world. A temporary arrangement was made for the 2012 elections, but that procedure expires before the 2014 election, so delegates will be implementing a permanent procedure going forward. Mike Spence and Deborah Wilder propose that in any primary where there is more than one Republican, the state party will only endorse if 2/3 of the Board of Directors votes to do so after a request is made for the state party endorsement by the Chairman of each affected County Central Committee and only if each affected County Central Committee (by a 2/3 vote) has endorsed the same candidate. Spence and Wilder also propose that any Republican who is the sole Republican on the ballot is automatically endorsed. Spence and Wilder’s proposal does permit the CRP Board of Directors (by a 2/3 vote) and each affected County Central Committee (by a 2/3 vote in each County) to adopt an endorsement procedure in a district wherein every Republican registered to vote in the district (including overseas military personnel) can vote on the endorsement. Jon Fleischman proposes that endorsements be made by all voting delegates of the State Party and all County Central Committee members present at the state party convention in the Spring before the primary will vote to endorse a candidate, provided that “60% + 1” of those present and voting vote to endorse that candidate. There will be no more than three rounds of balloting, and the candidate with the lowest number of votes will be dropped from the first round and again from the second round. Should no candidate achieve “60% + 1” in the third round, there is no endorsement. Unlike all other state delegate votes, there will be no proxy voting allowed (similarly, proxy voting is moot in the Spence/Wilder and Abrahms proposals since County Central Committees do not have proxy voting nor does the State Board of Directors). Adam Abrahms proposes that in any primary where there is more than one Republican, the state party will only endorse if 2/3 of the Board of Directors votes to do so, provided that the Board of Directors may not endorse any candidate whose opponent has been endorsed by at least one affected County Central Committee. He also proposes that a majority of any affected County Central Committee may vote to preemptively veto a state party endorsement, no later than five days before a state party endorsement meeting. Abrahms also proposes that any Republican who is the sole Republican on the ballot is automatically endorsed. He also defines an affected County Central Committee is one where at least 5% of the precincts in the district are in that county.